Michelle Obama has a new memoir out called "Becoming." Add two words: "Very Wealthy." The Obamas struck a $65 million book deal for his-and-hers memoirs, and next to it is their $50 million production deal with Netflix. They are set to cash in to the tune of hundreds of millions of dollars. One outlet has called them a "billion-dollar brand." None of their media sycophants find this the tiniest bit controversial. They are the royal family. They cannot possibly be compensated enough. Mrs. Obama's interviews -- entirely with women, and mostly black women -- are servile in every "objective news" venue and even worse during TV promotional pit stops. Ellen DeGeneres aired a sappy tribute video stuffed with adoration and proclaimed that Obama is "a human being that we all look up to." She said, "you inspire all of us. So, we put together a little something for you to just show you how amazing you are." No one asks about any Obama scandal, like the 2012 Benghazi attack. No one asks about her controversial, heavy-handed school lunch rules, which Trump thankfully threw out. And no one asks about greed. She has a 10-city stadium tour charging $300 a ticket or more for the superfans to hear her speak. Is it appropriate to cash in on her FLOTUS status this way? How much, if any, has gone to charity? These kinds of questions are unacceptable. This is Michelle Obama. Republican first ladies can only dream of this kind of treatment. To understand the fawning nature of this coverage, consult Andrea Mitchell's "reporting" on the "NBC Nightly News." 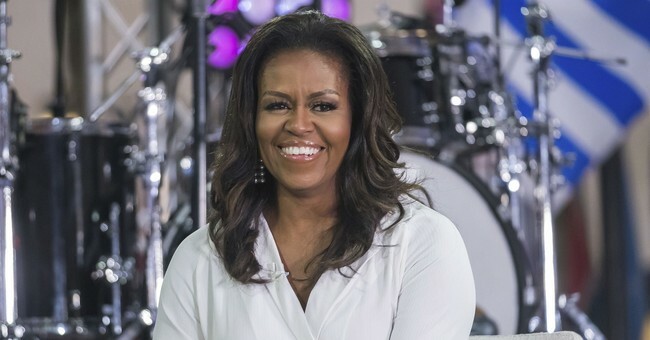 On Nov. 9, Mitchell offered an infomercial for Mrs. Obama, saying, "After fiercely guarding her privacy in the White House years, now the most revealing memoir ever written by a former first lady, ripping President Trump's false accusations about her husband's citizenship as bigoted and dangerous." Michelle's body "buzzed with fury after the infamous 'Access Hollywood' tape," Mitchell said. To break up the commercial, there were a few seconds of a clip of President Trump saying, "She got paid a lot of money to write a book, and they always insist you come up with controversial ..." NBC wouldn't even air the end of the sentence. Did Michelle's body buzz with fury when former President Bill Clinton's accusers resurfaced to remind people that he sexually assaulted them? Nobody asks. Mitchell finished the Obama report talking about "intimate details" that were the publisher's talking points, like Obama's "devastating miscarriage" and some marriage counseling she went to with Barack. Oh, and Mitchell said Obama is "on a tour befitting a rock star." Now compare. Eight years ago, first lady Laura Bush's memoir was released, and there was Andrea Mitchell. She began with then-President Bush's mangling of the Hurricane Katrina optics, saying: "She writes about Katrina. August 31st, two days after the hurricane struck, the levees had failed. People were desperate. The president flies over instead of visiting." Mrs. Bush says the president flew over to keep his convoy of vehicles from blocking helpful supplies. For rebuttal, NBC put on liberal historian Douglas Brinkley, who bizarrely claimed the government was conspiring against help: "the federal government was stopping trucks from Walmart and Kmart with water and food from even arriving." Then Mitchell discussed the Bushes' fear of being poisoned at a German summit in 2007. And then, for a trifecta of "good news," she brought up Bush's "lifelong guilt" over having killed a 17-year-old friend in a car accident. If that contrast sounds like a joke, it is. But it's also real. Most Americans would like the media to tread lightly with the first ladies, especially after they've lived in the White House. But the liberal media have savaged Nancy Reagan and the Bush wives, and they're not exactly rolling out a red carpet for Melania Trump. The favoritism cannot be more obvious.